The St. Louis Auto Show was this week, which reminded us of the very fun Pistons and Pearls charity gala we performed at a few years ago. Accolade has been proud to be a part of charity events that cumulatively have raised more than $1 million. We offer a discount for charity fundraisers, so if you're on the board of a charity and are planning your annual gala, give Accolade a call! We're proud to announce that Accolade is teaming up with Mary Bauer, the 2014 Miss Gateway St. Louis, for an evening of music and dancing at Glen Echo Country Club on Saturday, April 5. All proceeds will benefit the Children's Miracle Network. At only $25 per ticket, this is the most affordable charity event in the band's history. Accolade was honored to perform at the wedding of Mary's sister in 2013, easily one of the most beautiful and fun celebrations in St. Louis last year and a great example of why Accolade is so fortunate to be a premier St. Louis wedding band. This family really knows how to throw a party, and you won't want to miss your chance to be a part of this one. For tickets, contact Teresa at tbauer@socket.net or 573-450-4889. St. Louis dance band Accolade was honored to be a part of a beautifully unique wedding reception last fall for our clients Trudy and Robert, who planned their St. Louis wedding from London. Following numerous Skype video calls and e-mails with our overseas clients, we customized our performance to complement their one-of-a-kind British-American wedding, and we love the results. Our tagline is "A Fusion of Energy and Elegance," and this video from Trudy and Robert's wedding captures that concept perfectly. Thank you to the amazing videographers at Forte Photography & Cinema for sharing this video with us, and thank you Trudy and Robert for allowing us the privilege of being a part of your unforgettable celebration. St. Louis dance band Accolade will be performing at another amazing charity event on Saturday, February 23. Join us at the Mardi Gras Masquerade, benefiting The Women's Safe House. All of us in Accolade were honored to be a part of the St. Louis Auto Dealers Association's annual charity gala, Pistons & Pearls, on January 26. In conjunction with the St. Louis Auto Show at America's Center, this event drew more than 600 St. Louis socialites and raised over $100,000 to support The Boys and Girls Clubs of Greater St. Louis, Friends of Kids with Cancer, JDRF, Make-A-Wish Foundation, National Multiple Sclerosis Society, the St. Louis Auto Dealers Charitable Foundation and TASK (Team Activities for Special Kids). We also were thrilled to share the entertainment responsibilities with speed painter and internet sensation Dan Dunn, who painted this amazing canvas of John Lennon in less time than it takes us to play some of our songs. If you ever have the chance to see Dan Dunn live, don't miss it. In the second installment of our band member biography series, we spoke with Accolade’s drummer, manager, and background singer, Mark Brown. How long have you been playing drums? When did you first start? I’ve been playing drums since 5th grade, but I started taking piano lessons when I was 5 years old. My mother is an elementary school music teacher, and I’m fortunate that she encouraged me to begin at a very early age. My dad saw a classified ad in the newspaper for a used drum set at a good price, and he asked whether I might be interested in it. Of course I said yes. What kid wouldn’t? I was so grateful and immediately fell in love with playing drums, especially when I started taking lessons from a really outstanding jazz drummer and began to discover how musically expressive the drums could be. It was such a nice change of pace from the more rigid constraints of classical piano lessons. My dad’s purchase turned out to be a pretty good investment, because I used my hobby of playing drums to help pay for college and law school. What are your best skills as a musician? I’ve worked really hard at being a well rounded, versatile player. A lot of musicians confine themselves to one or two styles, but I think that restricts their opportunities to grow as musicians. One of the things I really enjoy about playing with Accolade is that we cover so many different genres, and this challenge to sometimes go outside our comfort zone helps keep our playing fresh and exciting. Playing with Accolade also has taught me to be more disciplined and to always “serve the song.” When I was less experienced, I thought it was important to show off my “chops” and to impress people with my speed and creativity. Now I understand better that the notes a musician doesn’t play can be even more important than the notes that are played. My job in Accolade is to make people want to dance, and I try never to play a note that interferes with that goal. Finally, I’m really neurotic about my technique and the sound of my drums. It means a lot of extra work for me, but unlike many drummers, I tune my drums religiously before each performance and replace drumheads regularly, and my setup takes a lot longer than most because of the microphones and gear I use. One of the things that really separates Accolade from our competition is our pristine sound quality and our ability to control our volume, and they wouldn’t be possible without the extra effort I put into creating my drum sound. What do you enjoy most about performing with Accolade? How is Accolade different from other bands you've been a part of? I absolutely love the enthusiastic reaction and appreciation we always get from our clients and their guests. It’s hard to describe exactly what it is, but people recognize there’s something very unique about Accolade. It’s something that no one is ever expecting, especially not from a “wedding band” in St. Louis. Accolade has a certain soul and energy, plus a sound quality, that people aren’t used to hearing in other bands. You really have to experience it to know what I mean. It also doesn’t hurt that we have such tremendous lead singers, and I never get tired of watching the crowd fall in love with them. What do you enjoy most about performing at weddings and special events? Believe it or not, I really enjoy the challenge of it. Most of our clients are hiring us for the biggest, most important party they’ll ever throw. It’s a once-in-a-lifetime event, and they count on us to help make their evening as perfect as possible. That’s an awesome responsibility, but also a great honor. In addition to playing drums, I’m the band’s manager and the main contact for our clients, so I’m on the front line when it comes to helping them feel confident that things will go smoothly and that they’ll have the time of their lives. Their appreciation when we exceed their already very high expectations is extremely rewarding. When you’re not busy learning new songs for Accolade, what music do you have in your iPod? My musical tastes are very diverse, almost to the point of absurdity, but it usually rotates between jazz and classic rock, with a touch of R&B and country. I enjoy anything that's high quality and am always trying to become a better musician by listening to other players. Of the artists that Accolade covers, my favorite probably would be Stevie Wonder. What do you think is the main reason that brides & grooms and corporate event planners should hire Accolade? We’re 100% committed to making their events a success, and we have the talent and experience to make it happen. They won’t have to worry about us delivering on our promises, and their guests will thank them for hiring us. It’s really that simple. Are there any Accolade performances that are particularly memorable for you? We were hired by Shirley King, daughter of blues legend B.B. King, to be her backup band at a blues festival in Kansas City. We’re not a blues band, but she really liked what she heard on our website and apparently thought our sound would provide the spice she was looking for. Her schedule didn’t allow for her to rehearse with us in advance, so literally our first note together was on stage in front of thousands of people. Fortunately, the concert went off without a hitch, and hiring a non-blues band turned out to be a great decision for her. We brought our signature soul and energy to the stage with us, and the audience got to hear something very different from the other blues bands at the festival. Shirley is a great entertainer with a legendary pedigree, and it was a real honor to share the stage with her. Of the myriad decisions that brides and grooms must make about every aspect of their weddings, one that often is not given much thought is where to place the band. This decision can have a major impact on the quality of the band's sound. Some venues have a specific spot where they require the band to set up, and sometimes wedding planners prefer one location over another. We always defer to them in these situations. But sometimes there are multiple options, and in those circumstances, we are happy to offer some advice that can enhance the entertainment experience. Before we share this advice, it’s important to acknowledge that the location of the band also can affect the visual aesthetics of your reception. We don’t claim to be design experts, and we realize that for many brides and grooms, the visual impact of their ballroom is their most important consideration. (That’s why we always take extra time to conceal our cables and make our stage area as tidy as possible.) If you want the band in a corner so that they’re hidden out of the way when your guests first walk into the room, we understand. Everyone has to prioritize. But if optimal sound quality is one of your priorities, then keep reading for some considerations you may want to take into account. The main advice is to configure the room so that the tables are in front of the speakers, rather than to the side of the speakers. 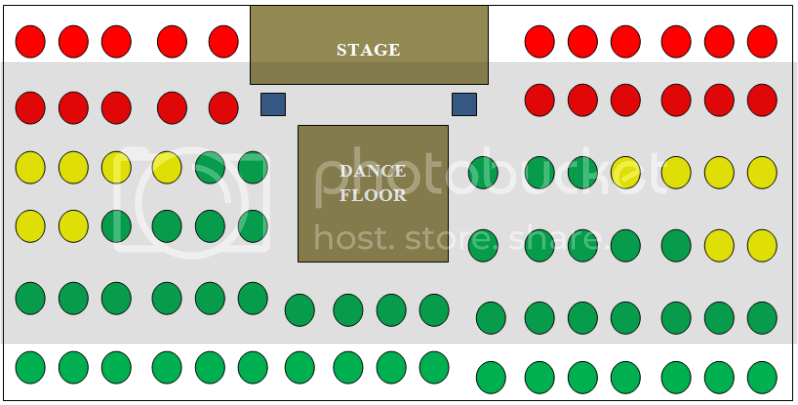 This is illustrated in the diagrams below, but in a typical rectangular ballroom, we recommend placing the band in the middle of one of the shorter walls, facing the far end of the room. Here’s why. Most bands and DJs have two speakers or speaker arrays. Where they’re located influences how consistent they sound throughout the room. The lower frequency sound waves (produced by bass guitar and drums) are omni-directional, meaning that they travel consistently in 360 degrees from the speakers. Think of them like the water from a rotating sprinkler system, covering a circular area. The mid-range and especially the higher frequencies (produced by vocals, saxophone, guitar, etc.) are unidirectional, meaning that they travel basically in a straight line in front of the speaker. Think of them like the water from a garden hose, covering only the area toward which the hose is pointed. The result is that while guests in front of the speakers enjoy the full range of sound as it was intended, guests on the side of the speakers will hear only the low frequencies, making the music sound muddy to them. It also will be harder for them to hear toasts and announcements clearly. The diagram above illustrates this principle. The speakers are represented in blue. Assume that the high frequency sound waves travel at about a 45 degree angle from the corner of the speakers. (Some of the highest quality speakers, like those Accolade uses, can project consistent sound closer to 90 degrees from the edge of the speakers, but 45 degrees is a safe rule of thumb.) Guests seated at the green tables will enjoy a clean, full-range sound. Those at the red tables will hear a bass-heavy, muddier sound. The speakers work much like your eyes in that there is greater clarity directly in front than there is off to the sides. Consider how much clearer your direct-line vision is than your peripheral vision. To draw another visual analogy, setting some of your guests in front of the speakers and others beside or behind them is like asking some of your guests to wear glasses that cause them to see your beautiful floral arrangements and centerpieces in black and white, while other guests are allowed to enjoy them in vivid Technicolor. This next diagram illustrates the consistency of the sound when everyone is in front of the speakers. We realize that there can be good reasons for choosing a room configuration more like the first diagram, and sometimes there’s no other option. For this reason, Accolade has invested in small additional satellite speakers that we sometimes add for the benefit of guests seated to the side of the main speakers. 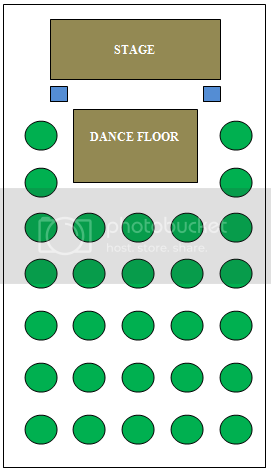 Most bands don’t have this option, though, and for clients who prefer to avoid the extra speakers to due to space limits or setup time restrictions, the suggested room configuration is worth considering. We've oversimplified the physics a bit for sake of brevity, the diagrams are not to scale, and there are several variations on these themes, but hopefully this overview is helpful. If you have questions about the best way to configure your particular ballroom, feel free to ask us. We're always happy to meet with our clients at their reception venue to offer our suggestions. Several people have told us they’d like to know more about the individual members of Accolade, so we’ll be interviewing and introducing each band member on our blog. We begin with Accolade’s bass player, Rob Dryden, who founded the group in 2001. A former Mizzou football player who works in law enforcement, Rob is one of the best bass players in St. Louis and is a huge part of Accolade’s signature sound and its success as a top St. Louis wedding band. How long have you been playing bass? When did you first start? I’ve been playing bass for approximately 28 years. I received my very first acoustic guitar as a Christmas gift in 1975. Although I loved music and loved attempting to play along with my favorite songs, I was young and not nearly ready for the responsibilities of owning and caring for an instrument. Unfortunately, I don’t think that first guitar lasted to see 1976 ... at least not in one piece. At age 9, I missed having an instrument, and my father tried it again -- this time as a birthday gift. I received my first electric guitar with an amplifier….WOW! An amplifier with a volume button…SERIOUSLY? The first few months my ears rang too much to know if I was really playing anything that sounded musical, but I did eventually learn that what I played was more important than how loud it was. What inspired you to play bass? My mother was very talented pianist and played often. She also sang in the church choir and held the position of choir president for many years. She kept our home filled with music regularly. My father was a guitarist and played in various bands prior to his passing at a very young age. Although I didn’t get to see him perform often, the times I did see him perform left deep rooted and lasting impressions which fueled my desire to perform. What is your best or most unique skill as a musician? I feel like I have a unique ability to “push” a groove and create movement in the music. This has to be done without collapsing the pocket of the groove. Keeping the bottom end groove in the music is the “bass man’s” primary purpose in any band. I have always felt if I combine the right amount of “skill” with “feel,” the combination is sure to make ya wanna dance. What is the most interesting/rewarding thing that has happened to you as a musician? 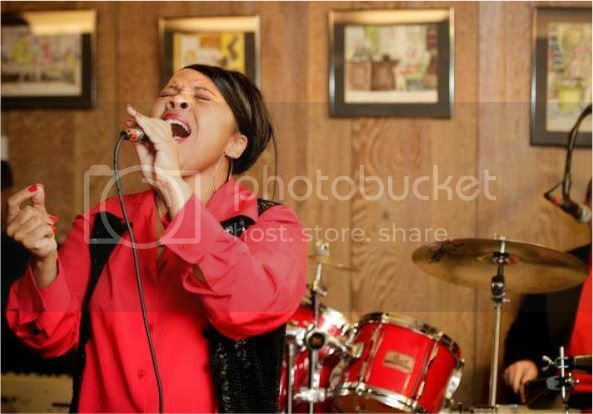 The most rewarding element of musicianship happens to me every single time I go on stage. It is the extraordinary “high” or feeling which overwhelms and consumes my soul when the music sounds and feels good to me. There’s nothing more rewarding than being able to use your own musical gifts and talents to contribute to such a wonderful feeling. What do you enjoy most about performing with Accolade? How is Accolade different from other bands you’ve been a part of? The incredible talent that each member brings to the band and the collective magic that happens as a result. I also respect and love the pride that each and every member takes in the performances we give. Accolade is the very first band that I consider the members to truly be family. Without question, the responses we get from our clients. It’s a wonderful feeling to hear clients convey that Accolade played a role in making their celebration a success. First, the quality of our product. But in addition to that, the variety in our music, which makes us appropriate for various segments of the event throughout the evening. Flexibility in terms of easing the client’s event coordination and planning. It also gives the client peace of mind and confidence that “everything is going to go smoothly.” Professionalism, and extremely important overall, is the PRIDE WE TAKE IN WHAT WE DO, and the determination to always deliver above and beyond the expectations of our clients. Over the years, the many charity fundraiser events we’ve done with great success. I always feel good about Accolade making a difference in the lives of others. When you’re not busy learning new songs for Accolade, what music do you have in your CD player? Fourplay, Pat Matheny, Mint Condition, Richard Elliot, Jonathan Butler, The Police, Billy Joel, Rush….Not in any certain order. Ending on a High Note: How Late Should a Wedding Reception Go? Clients often ask for our recommendations about how to organize a wedding reception for it to go smoothly, and we’re happy to offer our suggestions. As a top St. Louis wedding band for 10 years, Accolade has seen some really extraordinary receptions, and we have some helpful tips to offer. There are many ingredients in the recipe for the perfect wedding reception, and of course one of them is a great band. But one of the most important factors often overlooked is how late in the evening the reception ends. Picture a ballroom full of energetic guests joining you on the dance floor for your Last Dance, right before your Grand Exit as you and your new spouse depart for your honeymoon. Not just your bridesmaids and groomsmen in their 20s, but also Grandma and Grandpa and most of the other people who were important enough to invite to your wedding. You’ve just treated them to one of the most amazing parties they will ever attend, and the final memory they’re taking home with them is of the energy and excitement in the room—right up to the very last minute before your big sendoff. If that’s part of your definition of a successful wedding reception, then you can dramatically increase your odds of success by following a simple rule: Generally speaking, the receptions that end earlier in the evening are more likely to end on a high note than those going into the wee hours of the morning. This makes sense if you think about it. No matter how good the band is or how much fun your guests are having, attrition is inevitable after a certain point. Some guests will have to go home to relieve the babysitter. Others will need to let out the dog. Some guests, especially the older ones, aren’t used to being out late and will want to be home not much past their regular bedtime. Plus, if your ceremony was early in the afternoon, then expecting people to help you celebrate for more than 8 hours from start to finish may be unrealistic. Your big day will seem to fly by for you, but your guests won’t necessarily have the same perception of time—especially if they spend a long time in your receiving line, waiting for your bridal party photos, stuck in traffic between the ceremony and the reception site, etc. That’s just the way it is, and no matter how awesome your reception is, you can’t control these facts. So, what is the “perfect” time to wrap up a reception? There are too many variables for a one-size-fits-all answer, but for a typical wedding in St. Louis, we usually recommend stopping at 11 p.m. Although this is later than most of your older guests are used to staying out, they'll make an exception for your special day. Go until midnight, however, and it’s likely to be more than they can handle. You’re almost guaranteed to lose many of your older guests after 11. But unlike 10 p.m., 11 probably won’t seem too early for your younger guests. They will have had plenty of time at the bar and on the dance floor, and if they still want more, they can always meet up at the nightclub down the street for the after-party. But what if your friends are real “party animals” who love to dance? It’s your reception, and you know what your friends like. Just keep in mind that even the most avid dancers have limits. We’ve had the privilege of performing at a couple different wedding receptions for brides who were St. Louis Rams cheerleaders. One of them planned a reception with a full 4 hours of dancing after dinner. Most of her bridesmaids and many of her guests were Rams cheerleaders, so if anyone could handle 4 hours of dancing, it was them, right? But after 3 hours of a solidly packed dance floor, we literally wore them out. Even though they wanted to dance more, they were just too tired, so they sat on their chairs for much of the last hour and just enjoyed the show. So, your friends may be party animals, but can they really out-dance the Rams cheerleaders? We’ve seen some amazing receptions that were still thumping at midnight or even 1 a.m., but they probably could have ended on an even higher note if they’d wrapped up a little earlier. Accolade, like most bands, is always happy to accommodate our clients’ schedules. We'll play as late as you want, but why not maximize your odds of success? As a top St. Louis wedding band, Accolade performs primarily at country clubs and hotel ballrooms, but we also are equipped for much smaller events. This photo was taken at a Christmas party at a private home in Chesterfield. An in-home Accolade performance can bring your intimate gathering to a whole new level. As you can see from the photo, whether performing for 500 or a few dozen, Accolade always gives 110%. If you're planning a party at your home, consider allowing Accolade to help you make it an unforgettable experience for your guests.